Connect with your Audience for Election Campaigns : Political Parties : Vote Appeals VIA Bulk SMS in Delhi India. 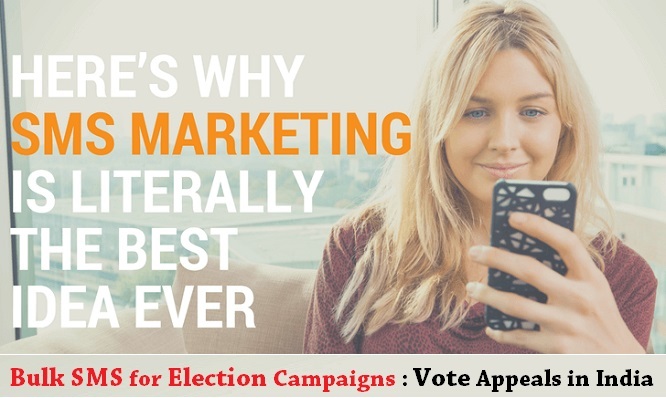 OMG India offers standard sms marketing service to political parties for election campaigns that help politicians to reach the voters directly via SMS for Vote Appeal in short time. At OMG India, We are trying to save the time and money to convey the message of politicians and candidates to the group of targeted people via stock sms marketing services. It has become really effective services in election time. SMS campaigns is one the economical tools that can be used easily as compare to other media like – TV, Radio, Newspapers, Magazines banners and posters. OMG India, Peak Appreciated election SMS campaigns service provider in Delhi India, offers India's No.1 Bulk SMS Platform with Platinum Telecom Partner which includes Best-In-Class Delivery, Full-Featured Tools, Real Time Reports, Quick & Easy Setup. We help our customers to choose the right templates and time to deliver information and updates that suits your election campaigns. As per Latest Election SMS Campaigning in Delhi India Survey, Election SMS has become the best Communicating media for Marketing, Advertisement, Promotion, Branding Business Growth, startups success and Reach to Millions of Customers‎ in one shot as compare to other media like News Paper, Radio FM, TV, News Channel and Outdoor Media. Election SMS Gateway Service Provider: OMG India is forward- thinking and one stop Election SMS Gateway Service Provider in Delhi India. We offer the Best In Class Delivery Interface to clients which includes options like Share Images, Web URLs, Full-Featured APIs, Real-Time Reports, Quick, Easy to use, Easy Setup, 24X7 Customer Support, Sender id, No Time Limit and many more. We offer Features that make us smarter.